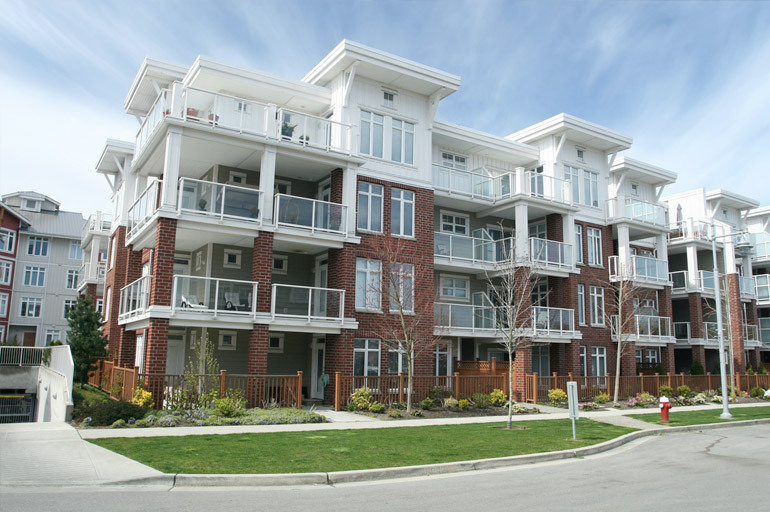 Some people may think that living in a condominium is the same as living in an apartment, just at different costs. While the premise of living in a multi-story building applies to both, what you receive at each is what sets condos apart from apartments. Amenities: Condo buildings usually contain well-equipped gym space, a door attendant or lobby staff, and a variety of other amenities designed to help make your life easier and more convenient. Apartment buildings don’t offer amenities as nice, if there are any at all. 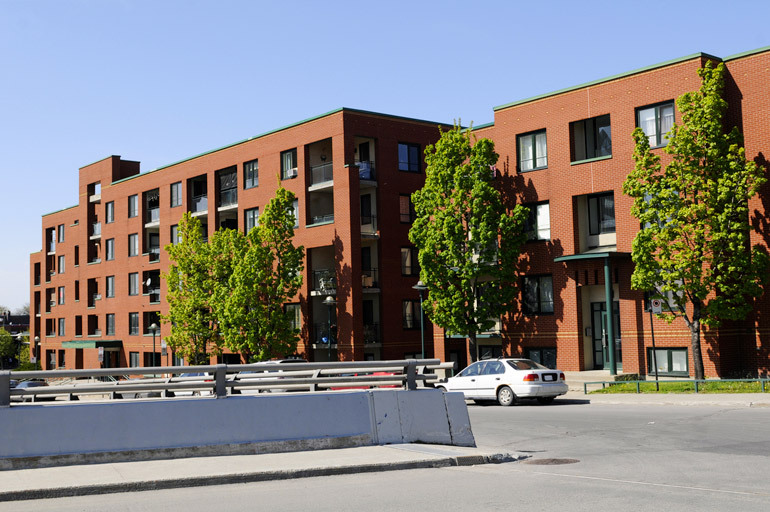 Parking: In a condo, you often get the benefit of a garage with an accompanying parking space for your unit, with the option to purchase additional spaces as needed. These parking spaces are assigned to you and are permanent for the duration of your time living in the condo. While living in an apartment, parking is often not assigned, and having a garage in the building is considered an amenity. Interior Design: The interior of a condominium has personalized hallways, entries, stairs, and front doors. The lobby is comfortable, and features high-end materials and finishes, similar to what you may find in a hotel. An apartment tends to offer little in the way of personalization, and instead stays with more generic colour schemes and décor. The lobby typically features one standout aspect to draw in renters. Exterior Features: A condo typically features traditional, timeless architecture made of low maintenance materials. 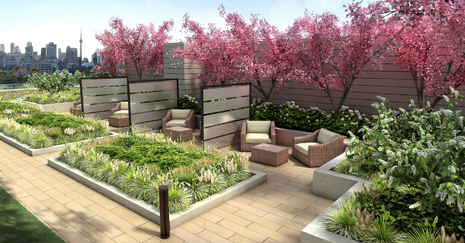 Surrounding the building are beautiful plants that have been carefully landscaped to increase the appeal of the area. Apartment buildings may have some green space but are often just brick or stone structures with parking lots surrounding them. Unit Details: When purchasing a condo unit, you have the option for custom packages, different finishes, and a variety of layouts. The units also include high quality sound-proofing and insulation, as well as more energy efficient systems throughout. Apartments tend to be standard, with a pre-set layout and everything meeting minimum requirements with little room for upgrades. If you’re looking for an upscale building with plenty of amenities, features, and details, be sure to look at what The Davies has to offer. Each of our units are fully equipped with everything you need in your home. We also provide additional communal space for entertaining, relaxing, exercising, and more. For more information on this exciting new condominium project in Toronto, contact The Davies at 647-360-9588 to book an appointment to meet with our sales team. You may also register online for more information, and browse our floor plans to discover which would best suit your household needs. High-Rise Living is a Big Part of Toronto's Luxury Condos! Toronto’s Exclusive Spas Right at Your Fingertips! What Constitutes a Good Luxury Condo Investment? For more information about Brandy Lane Homes latest project The Davies please register below. Take time to browse the floorplans of our beautiful suites. 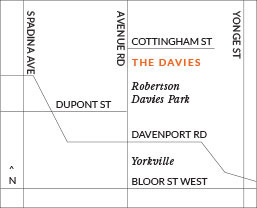 Contact us today for your chance to purchase your new home at The Davies. Be among the first to have the exclusive opportunity to reserve your luxury condo unit on the park. 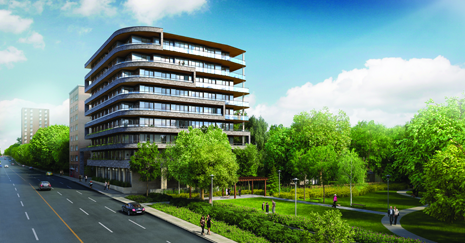 EXCLUSIVE RESIDENCES ON AVENUE ROAD AT COTTINGHAM, OVERLOOKING ROBERTSON DAVIES PARK. Large Spacious Suites. Available units from just over $2,000,000.